Witness the heart of your dear ones smile when you gift them this Nescafe Morning Hamper with Gift Voucher and make them feel at the top-of-the world. Treat your dear one with something extra special with this Anniversary Hamper which is smartly presented with CCD voucher of Rs. 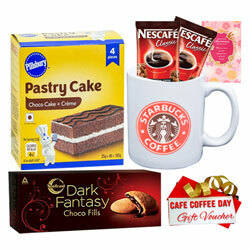 100, Starbuck Coffee Mug, Nescafe Coffee Pack, Pillsbury Cake, ITC Dark Fantacy and Archies Anniversary Card.